Following a five-trophy season would always be difficult. However, come December the League Cup was already claimed once more. Trailing 2-0 at half-time against Linlithgow Rose, the Star came roaring back to win 4-2 in a thrilling match with goals from Bailey, Ramsay, Lumsdaine and Reilly. In the Scottish Junior Cup, the Star had a number of postponements against Annbank United in the third round before winning 2-0 with goals from Bailey and Ramsay followed by an unsuccessful three-match tussle with Kilbirnie Ladeside in the next round. Those two ties had left the Star with a backlog of fixtures. At one stage the team had nine games in hand over league leaders Fauldhouse United. To the team's credit they managed to win most of those games to set up a midweek championship decider at Fauldhouse. However, the home side proved to be better on the day and secured the league title with a 2-1 win. It says much about the previous years of success to add that the Star 'only' added one other trophy to their list of honours as the Brown Cup was retained with a 3-1 win over Armadale Thistle with goals from Bailey and Ramsay (2). 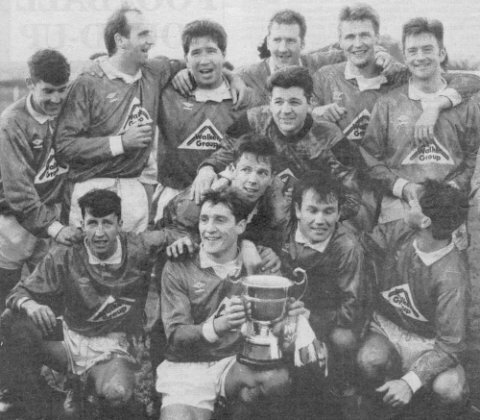 The cup winning team was Carswell, McColl, O'Donnell, Miller, Aitchison, O'Hara, Reilly, Parkin, Bailey, Ramsay, Ballantyne. Subs: Forrest, Lumsdaine. Bo'ness United H 1 1 O'Hara Carswell, Cochrane, O'Donnell, Lumsdaine, McColl, Fraser, Reilly, O'Hara, Forrest, Ballantyne, Ramsay. Subs: Dall, Parkin. Bonnybridge Juniors H 5 0 ? Bonnyrigg Rose H 3 2 ? Linlithgow Rose H 3 4 Bailey 3 Carswell, Aitchison, Fraser, Miller, McColl, Richardson, Ramsay, Lumsdaine, Forrest, Ballantyne, Bailey. Subs: Dall, O'Hara. Livingston United H 1 1 Parkin Carswell, Aitchison, O'Donnell, Lumsdaine, McColl, Fraser, Reilly, O'Hara, Forrest, Cochrane, Dall. Subs: Tracey, Parkin. Whitburn Juniors H 1 1 ? 1 A Dunbar United 6 2 Cochrane 2, Bailey 2, Ramsay 2 Carswell, Miller, Fraser, Lumsdaine, Aitchison, Richardson, Cochrane, O'Hara, Bailey, Ramsay, Reilly. Subs: Ballantyne, McColl. F N Armadale Thistle 3 1 Bailey, Ramsay 2 Carswell, McColl, O'Donnell, Miller, Aitchison, O'Hara, Reilly, Parkin, Bailey, Ramsay, Ballantyne. Subs: Forrest, Lumsdaine. 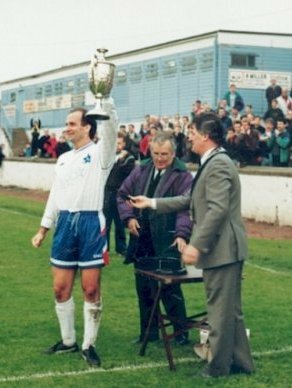 Junior Football season 92/93 finally finished last weekend with the playing of two concluding cup finals at Bo’ness and Arniston. Newtongrange Star who began the season winning the first trophy in December – the Skol Junior League Cup – finished off their season by winning another cup – The Brown Cup – to complete a fine double for the top Midlothian aces. 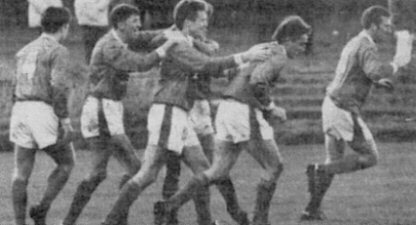 By beating Armadale 3-1, Newtongrange played their 48th game in season 92/93, scored 120 goals and conceded 50! Messrs Bailey, Ramsay, Lumsdaine and Reilly had given Nitten the Skol Junior League Cup from Linlithgow winning 4-2 (trailing 0-2 at half-time remember!) and it was the same deadly scoring combination of Gordon Bailey and Paul Ramsay which saw Star retain the Brown Cup with something to spare in the end at Newtown Park, Bo’ness last Friday evening, the night before the Newtongrange Gala Day. Twice before this season, Nitten had played Armadale in league encounters and won both 2-1, but by all accounts they had been well contested affairs and there was no room for complacency in the Buckley camp. Despite losing their last league match of the season 3-2 to Camelon three days before (Star had rested seven players and thrown away a 2-0 interval lead!) the return of the likes of Bailey, Ramsay, McColl, Carswell and Miller saw Nitten back at full strength along familiar lines. As cupholders, Newtongrange were pre-match favourites but a big Armadale crowd was eager to see Thistle succeeded in what was for them a rare cup final. Thistle had commendably beaten Bo’ness 3-1 in a replay after extra time in the semi-finals at Bo’ness while Star had walloped Bathgate 6-2. However, it was a lively Armadlae Thistle who attacked the ball and tested the Star defence early on with a thundering shot from left back Gibb giving Carswell an anxious moment. The Star soaked up this expected early pressure with Alan Miller in particular in immense form for Nitten, while on the counter attack Gordon Bailey posed the biggest threat to the Jags. Armadale’s red headed pivot Cowan was winning the aerial battle against Paul Ramsay who, however, eventually had the last laugh netting twice in the cup final. Porteous, the scorer of 22 goals, a lively no. 9 for Armadale, with his burst of speed, and Kevin McColl was booked in 30 minutes for pulling him down. From the resultant 20 yard free kick Carswell made light of the shot at goals from McMillan. The first half saw both teams strong in defence with precious little in the way of goalmouth excitement but just one minute from the break Star struck cup final gold! And it was super-striker Gordon Bailey, who prised open the Thistle defence in 44 minutes on to a through pass to round keeper Rab Douglas and hit home a brilliant opportunistic goal to send the cupholders in at the break 1-0 up. However, not before Gordon was booked for a small misdemeanour aimed at a section of the crowd! Armadale were expected to fight all the way to the final whistle and they did, but a confident, composed Star went on in that second half to win the cup fairly comfortably in the end. Four minutes into the second half and Tom Aitchison was booked (only his second of the season) for a foul. Nitten went 2-0 up when a cross from Jim Reilly was missed for once by pivot Cowan and gleefully Paul Ramsay drilled the ball into the Armadale net from 10 yards to open up a cup winning margin. Now the Star could relax a bit and stroke the ball around well and they entertained with some classy football. Plucky Thistle didn’t give up and only three minutes after Ramsay’s goal Thistle bounced back courtesy of an Alan Carswell blunder! In 63 minutes, a corner was swung over from the Thistle right and buttery finger Alan dropped the easy catch onto the head of McKean who headed home Thistle's Cup final consolation goal. Armadale thought they were back in the final and for a brief spell Nitten had to stiffen their resolve as Thistle were roared on by their big support. But Ballantyne was denied by a brilliant save by Douglas touching a tremendous volley from the Star striker on to the crossbar. A Paul Ramsay rocket shot was just inches wide as Armadale introduced attacking substitutes going all out for the equaliser now. 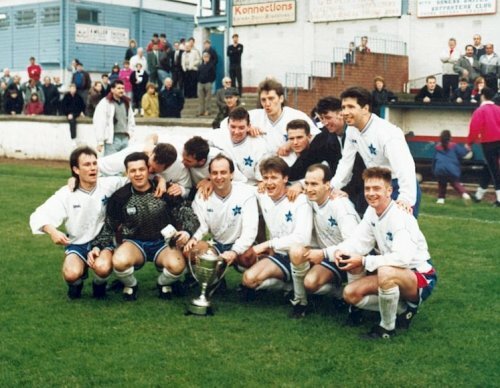 In 82 minutes Bobby Forrest substituted for Gordon Bailey but in the very last minute a sweeping, brilliant move the length of the park, involving McColl and Miller, ended with Paul Ramsay hitting home his own second and Newtongrange's third Cup final goal to end the season on the highest note as winners of the Brown Cup. A 4 1 Dall, Ballantyne, Ramsay, ? A 8 2 Lumsdaine, Forrest 2, Richardson 2, Ramsay, Bailey, OG Carswell, Aitchison, Fraser, Miller, McColl, Richardson, Dall, Lumsdaine, Forrest, Ballantyne, Ramsay. Subs: Tracey, Bailey. SF A Camelon Juniors 2 0 Bailey, Ballantyne Carswell, Miller, Fraser, Lumsdaine, McColl, Richardson, Ramsay, O'Hara, Bailey, Ballantyne, Forrest. Subs: Reilly, Tracey. F N Linlithgow Rose 4 2 Bailey, Ramsay, Lumsdaine, Reilly Carswell, Miller, Aitchison, Lumsdaine, McColl, Fraser, Ramsay, Ballantyne, Bailey, Forrest, O'Hara. Subs: Reilly, Cochrane. The Star played the first half of this Skol Junior League Cup Final at neutral Newbyres Park, Gorebridge like a Primary Six girls team from Sixth Street to trail 2-0 at the break. 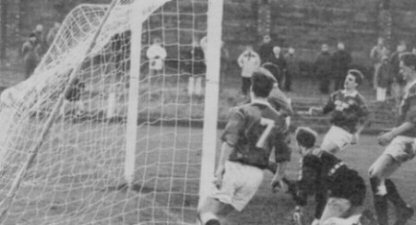 But once Gordon Bailey had broken the Linlithgow defence's stubborn resistance then the Star were on their way to victory over the West Lothian aces who finished with only nine players after having two off in the second half. So the crown of the East Region's number one still shines above Victoria Park after yet another cup final victory for John Buckley's gladiators. The Star had experience from jersey number one out to number 11 but in that nightmare first 45 minutes they were so uncharacteristic - passing badly, tackling weakly and generally looking hung over. It was no surprise therefore when Linlithgow opened their account in the 11th minute from their first corner on the left taken by "Grinder" Halcrow. The Star defence looked static as Aitchison first blocked a McGonigal shot on the line but STEVIE BICKMORE stabbed the rebound home to give the Rose first blood. Second best in the air, the Nitten outfit were losing out in the tackle too and the Star brows were further furrowed when big MALCOLM MORRISON showed the way forward with a brilliant but unchallenged headed goal in the 29th minute that had the Linlithgow fans dancing on the terraces. Following this Mark Ballantyne tried to shake some life into a lacklustre Star midfield but despite some signs of a spirited response, like Craig Lumsdaine hitting the bar, Star took their break 2-0 down and deservedly so. But after the interval it was pure "Roy of the Rovers" stuff with the final turned on it's head as Nitten exploded back into a game in which they had looked dead and buried in THE most dramatic turnaround in any cup final. To their credit, Linlithgow kept the game open and attacking but eventually the Star broke their duck in 67 minutes. Top scorer GORDON BAILEY - that marksman supreme - took a pass from Paul Ramsay to score with a brilliant finish beating keeper Mark Glynn to offer the Star the chance of a revival. Another marksman of the highest order PAUL RAMSAY - brought the scores level in the 76th minute when he bulleted home a pass from Gordon Bailey as the two strikers combined magnificently to carve open a crumbling Rose defence. And crumbling they were just one minute later as CRAIG LUMSDAINE scored number three - Nitten's 60th goal of the season - again with clever play in the danger zone. It was now Newtongrange Star's supporters who were doing the dancing on the terraces. Derek Halcrow (booked earlier) was sent off in the 79th minute for retaliating against Bailey for his challenge on keeper Mark Glynn. And with the mayhem - particularly for Linlithgow - now continuing there was further disaster for Rose when Scottish International keeper Mark Glynn received his marching orders for a fairly soft challenge on Bailey just five minutes from time. Applying the rule strictly, referee Underhill was correct as Bailey was clean through but there was some sympathy for Glynn's frustration. Left back Kearney deputised in goal for the now beaten nine man Linlithgow. Jim Reilly substituted for Mark Ballantyne and Robert Cochrane also got on in the dying stages. The icing on the cake as Nitten retained the League Cup came in the last minute when JIM REILLY waltzed through the demoralised Linlithgow defence to beat Kearney for a stunning fourth and final goal. The big Nitten support stayed behind to cheer their heroes as John Wilson of the sponsors, the Alloa Brewery Company, presented skipper Kevin McColl with the Skol League Cup. Newtongrange Star: Carswell, Miller, Aitchison, Lumsdaine, McColl, Fraser, Ramsay, Ballantyne, Bailey, Forrest, O'Hara. Subs: Reilly, Cochrane. Linlithgow Rose: Glynn, McKeeman, Kearney, Malcolm, Morrison, Fowler, Curran, Thorpe, Bickmore, McGonigle, Halcrow. Subs: Ormond, Clark.